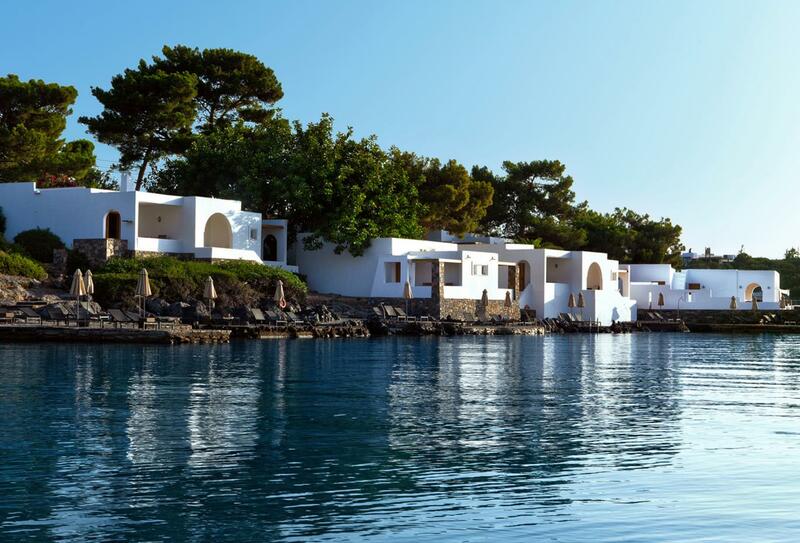 A luxury addition to portfolio of the Small Luxury Hotels brand, Minos Beach Art Hotel is located on the water’s edge on the island of Crete. Surrounded by fragrant gardens and the euphoric views of the sea, this is an ideal hotel for couples, either on a honeymoon or on a romantic vacation. 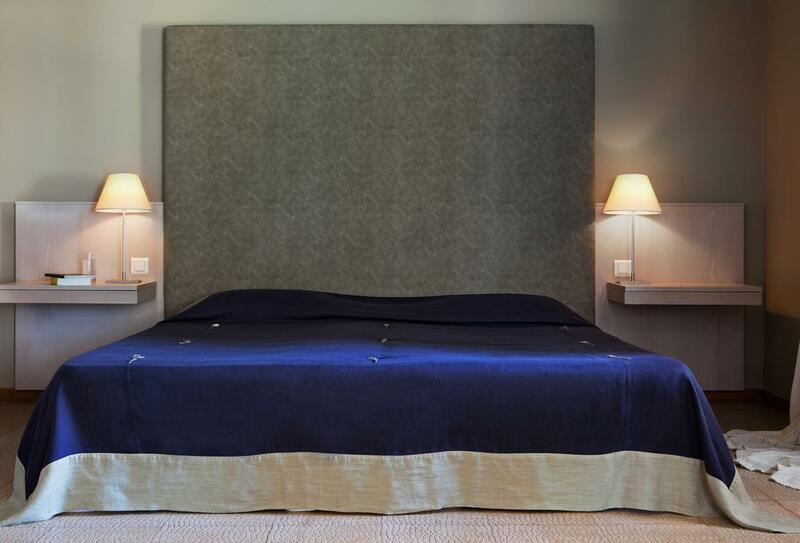 As well as minimalist interiors and niche architecture, the hotel is in possession of an abundance of luxury rooms, bungalows and villas, some with swimming pools and terraces. 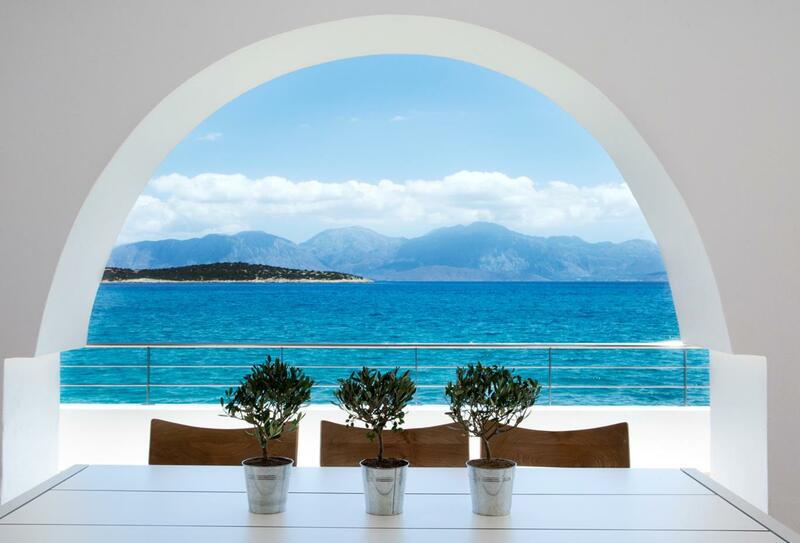 Award winning restaurants can be found at Minos Beach, alongside gallery exhibits and a pampering spa. Wake up to the views of lush green gardens surrounding your Junior Suite Bungalow. These bungalows feature a veranda and an open plan layout, ideal for a longer stay like a honeymoon with its separate living area. 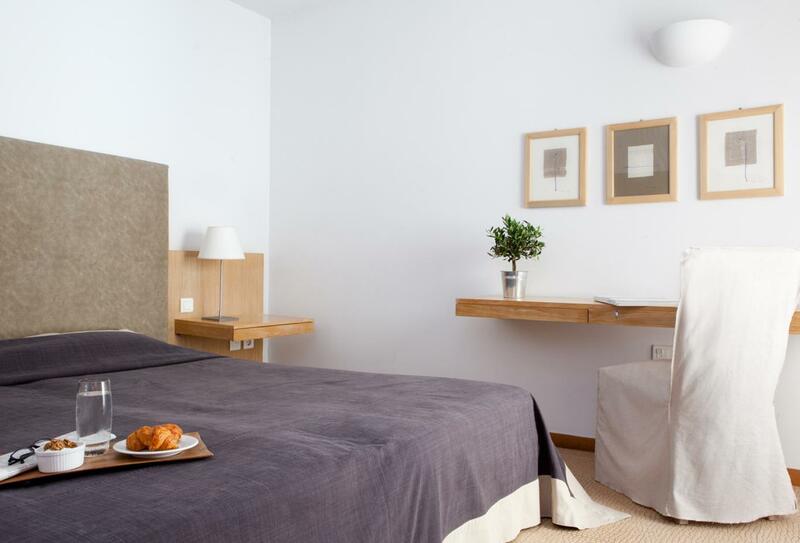 Located in the main building and outfitted with an exceptional smorgasbord of amenities, these Double Sea View Rooms look out onto the sea from the comfort of a large balcony. Spacious and stylishly simple, the Superior Bungalow Seafront ensures a stay of luxury with its open plan layout and separate living room. 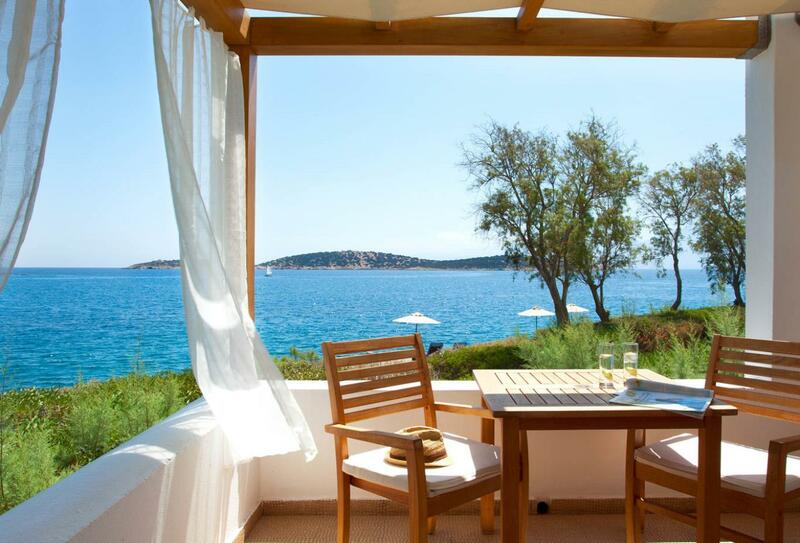 Enjoy vies of the sea from a large veranda. 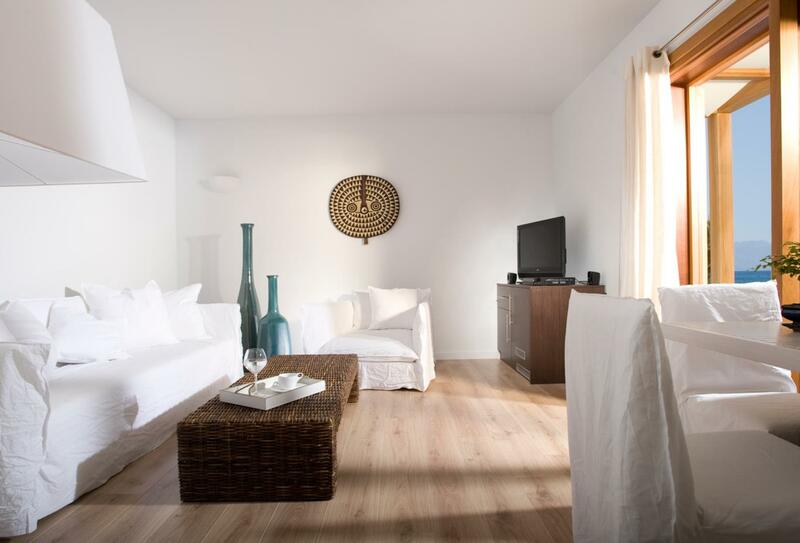 In a fortunate position on the second row of the water’s edge, the Bungalow Sea Front room features a spacious balcony and a host of modern facilities. 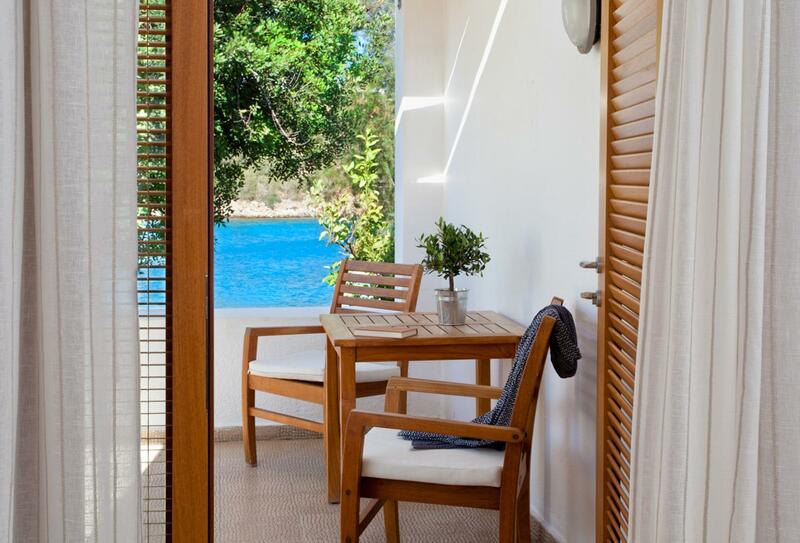 Ideally set on the water’s edge, the Bungalow Waterfront features a large veranda and elegantly decorated bedroom. The crowning jewel of any these Superior Bungalow’s is its private pool and its private balcony or terrace. Enjoy sea views and the serenity of the sunbeds. 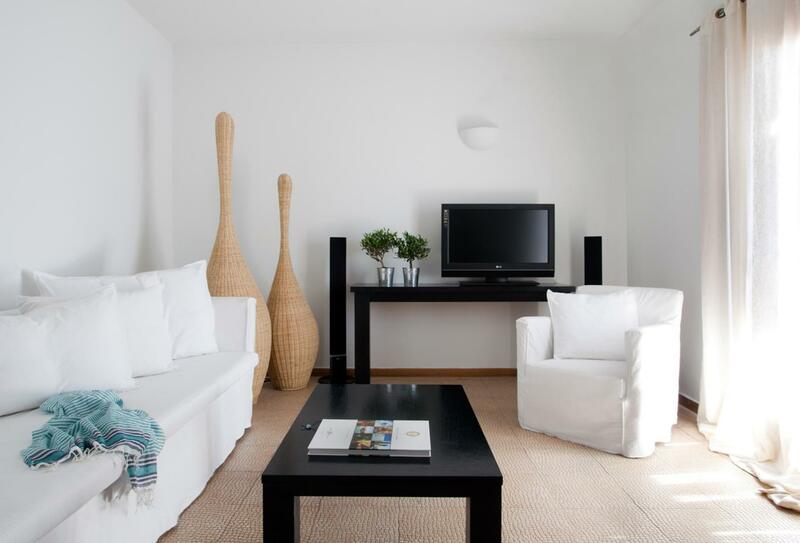 The One Bedroom Villa with Private Pool incorporates a minimalist, contemporary ambiance to its stunningly stylish interiors. Amenities include a home cinema and a private pool, as well as a terrace or balcony. This spacious Executive Villa is complete for two bedrooms, ideal for friends and couples travelling together on a fun holiday. A living room offers a social space, while the private swimming pool is also on hand for leisure activities. 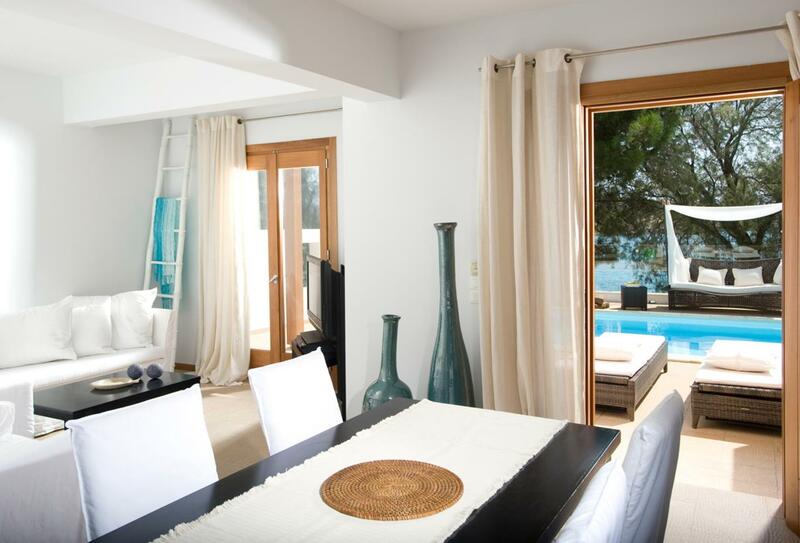 The largest and most luxurious of the accommodation options at Minos Beach Art Hotel, the Presidential 3 Bedroom Villa Private Pool is situated on the water’s edge and features a private swimming pool and sheltered sun terrace. 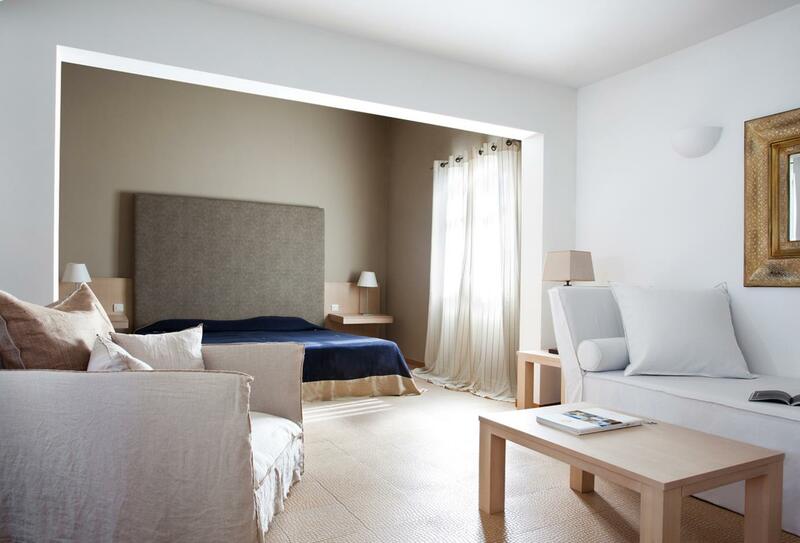 This villa is perfect for large groups of friends who need that extra bit of space and chance of seclusion. 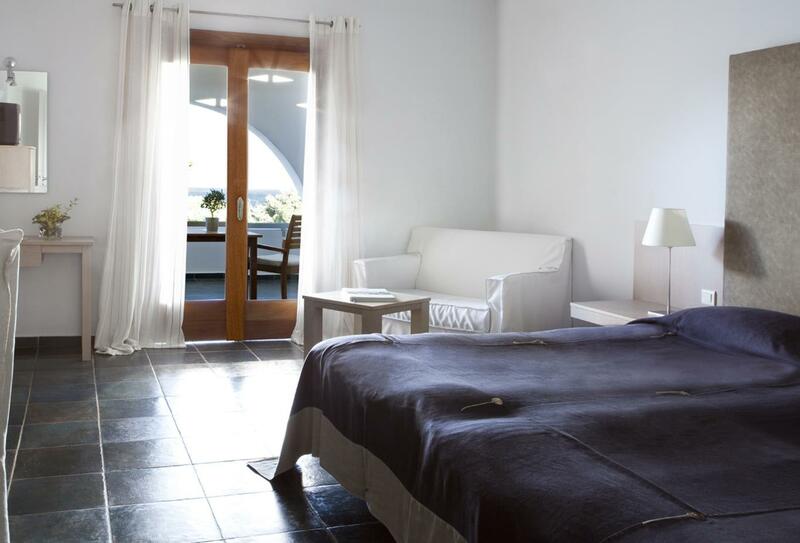 A living room and kitchenette links the villa together and there is also a bathing area with access to the sea. 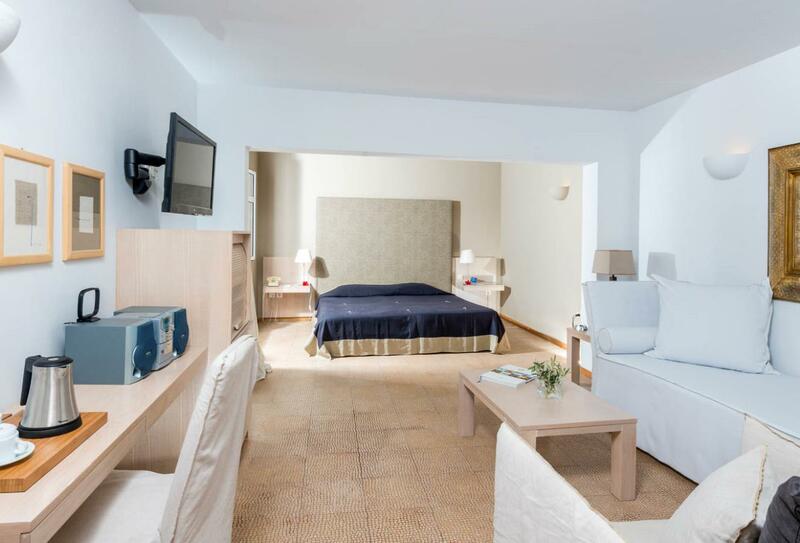 Operating since 1987, Pegalos Dive Centre is conveniently located on the grounds of Minos Beach Art Hotel. With courses designed for beginners and experienced divers in equal measure there is much to explore in the local region, including wrecks, rocky slopes, caverns and reefs. A purpose built dive boat named Posidonia is licensed to carry 24 divers to areas holding octopus, parrot fish, trigger fish and a kaleidoscope of exotic sea life. Divers can also hire a digital underwater camera and rest assured that the waters are calm, clear and warm. Spooning the waterfront, Ananea Wellness invites you to relax and reawaken your body and mind in a confident aura. Indulge in face and body treatments, or revel in special occasions by treating yourself to honeymoon and birthday deals. In its elegant and laid back environment, guests can enjoy the refined taste of exotic cocktails and smooth coffee. Open 17:00 – 01:00. Never leave the embrace of the swimming pool to order your cocktails and fruit juices at the Ibiscus Pool Bar. Guests can also order light snacks and ice cream. Open 10:30 – 18:30. Set on the beachfront to the ambiance of lounge music, the Pure Lounge Bar profits from sea breezes and majestic views of Mirabello Bay. Enjoy finger food, tangy juices and smooth coffees. Open 11:00 – 19:00. Enjoy a selection if internationally favoured breakfast items at Bacchus Main Restaurant. Scrumptious buffets for breakfast and dinner use only the finest local ingredients. Open for early breakfast 05:00 – 07:00, main breakfast period 07:30 – 10:00 and dinner 19:00 – 21:30. A wide variety of dining options await at Ambrosia Restaurant. Choose from a great selection of dishes from an a al carte menu, or pick at the freshly prepared salads and the assortment of cheese. The desserts are to die for. Open 19:00 – 21:30. Terpsis Cretan Restaurant places an enormous emphasis on the importance of its freshly gathered ingredients. Cretan cuisine is created using daily, fresh caught fish, fresh vegetables and fragrant herbs grown in nearby gardens. Open 13:00 – 15:00. Indulge in the aromatic flavours of the Mediterranean at La Boillabaisse. The restaurant is a member of the Cahine des Rotisseurs and nuzzled the water’s edge. It’s a la carte functioning has garnered several awards between 2003 and 2009. Open 20:00 – 23:00.